THERE are definite limits to the climbing powers of any conventional type of locomotive. When the gradient becomes too steep the adhesion is insufficient to move the train, and the wheels “spin” idly on the rails. Whenever possible, therefore, mountain railways are built with wide sweeping curves or spiral tunnels to gain height with the easiest gradient that circumstances permit. Often, however, the engineer has no alternative but to scale the mountain-side by a direct route. Then some means of increasing the adhesion between engine and track becomes essential. Several methods have been evolved and put into practice in many parts of the world. The most common form of mountain-climbing device is the rack or toothed rail, with which engages a power-driven pinion wheel on the engine. The rack and pinion for railway work was patented by John Blenkinsop in 1811, and was adopted on the lines of the Middleton, Kenton, and Coxlodge collieries in 1812-13. These colliery lines were not, of course, mountain railways, and Blenkinsop’s idea was to enable a light engine to haul a greater load than had been found possible with a heavy engine having smooth wheels. At that time it was not practicable to increase the weight of the colliery engines, as the available tracks were incapable of carrying heavy locomotives. PATENTED IN 1811. A simple form of rack rail invented by John Blenkinsop was used on a colliery line so that heavier loads might be drawn. In 1829 a train of 140 tons is believed to have been drawn by a Blenkinsop locomotive up an incline of 1 in 440 at about three miles an hour. This was a considerable feat at that time. In a report made to the directors of the Liverpool and Manchester Railway it is recorded that in March, 1829, a Blenkinsop locomotive had drawn a load of thirty-eight wagons, weighing a total of 140 tons, up an incline of 1 in 440 at a speed of two to three and a half miles an hour. F ollowing on Blenkinsop’s invention, patents were granted in 1824 to a Mr. Snowden for a rack rail that in essential principles had a counterpart in the Locker system used on the Pilatus railway over sixty years later. “Manual labour superior to steam used upon railways. A RACK-RAIL SYSTEM patented in 1834. On the inner side of the two flat-topped running rails a horizontal rack was provided. A capstan was to have been used for driving the carriage by means of a pinion wheel engaging with the rack. The wagon was to have been fitted with a roller at either end, running in a hollow central rail, to guide it along the track. Snowden suggested the use of a pair of flat-topped rails, one of which was to have a rack on its inner side, the teeth lying horizontally. A hollow rail of U-section was to be laid midway between the running rails. The wagon was to have flangeless wheels. To keep it on the track rollers were fitted at either end, to run in the central hollow rail. To propel the wagon a toothed wheel on the lower end of a vertical shaft engaged with the rack. To the upper end of the shaft was to be fitted a winch or capstan turned by four men. It was proposed that this rack-railway should run “up hill and down dale” without recourse to the making of easy gradients. Presumably the “manual workers” were to wind the wagon to the top of an incline and then stand clear of the capstan bars on the downward journey. There is no record of this scheme having been put into practice. In 1836 a rack locomotive was built at the Neath Abbey works for the Dowlais Ironworks. This engine had outside cylinders driving the rear wheels together with a pinion wheel gearing with a rack laid between the rails. The pinion wheel could be lifted up on level stretches of line not provided with a rack. Two years later the Neath Abbey works built a particularly interesting rack engine for the Rhymney Iron Company. This locomotive was probably one of the earliest articulated engines, and was carried on two four-wheeled trucks coupled together under the boiler. The trucks were provided with toothed wheels gearing with the rack and driven by a pair of outside cylinders through an auxiliary shaft. The teeth of the pinion were rounded to allow the articulated trucks to negotiate sharp curves. At Madison, USA, two Baldwin locomotives were put into service for operating a stretch of rack line in 1848. These engines had eight-coupled wheels driven by outside cylinders. The pinion was driven by a separate pair of cylinders placed vertically on the boiler. The pinion could be raised if required by means of a special steam cylinder. A GRADIENT OF 1 IN 10 was overcome by Riggenbach on a railway near Vienna. The rack on this line was laid between the rails and constructed in the form of a ladder with iron rungs riveted into the webs of shaped girders, placed back to back and 5-in apart. In 1874 M. N. Riggenbach built a standard-gauge rack railway up the Kahlenberg, near Vienna, with a maximum gradient of 1 in 10. The rack was laid between the running rails and was constructed in the form of a ladder with wrought iron rungs riveted into the webs of shaped girders placed back to back, about 5 in apart. The rack was constructed in 10 ft lengths, joined by fishplates and bolted to the sleepers. The running rails, of the flat-bottomed type, weighing 40 lb per yard, were secured to the sleepers by spikes. A model of the gearing and framework of an engine used on this line may be seen at the Science Museum, South Kensington. The engine, built by the Swiss Locomotive Works, Winterthur, was carried on four wheels, 26 in diameter. The outside horizontal cylinders, 13 in diameter by 17¾ in stroke, drove a countershaft carrying a pair of pinions. Below the countershaft was another shaft carrying three toothed wheels. The central wheel engaged with the rack - the side wheels with the pinions above them. An ordinary locomotive-type boiler was used with a steam pressure of 132 lb per sq inch. The carriages were pushed up the incline by the engine and no couplings were used. Three independent methods of braking were employed. A band brake was used on one of the crank disks. A toothed wheel on the back axle geared with the rack, and the axle was fitted with drums and brake blocks. The third method made use of the compression of air in the engine cylinders. Air was drawn in through the exhaust ports and forced out through a special regulating valve. Another safety precaution was the fitting of guards to prevent derailment. The engine tanks carried 220 gallons of water, with 25 cwt of coal in the bunkers. The weight of the locomotive in working order was 19 tons 9 cwt, and it was capable of pushing a load of 42 tons up the mountain-side. The ladder type of rack was not without defects, and in 1882 Mr. R. Abt patented an improved form of rack in which teeth were cut in the edges of narrow rectangular bars. These bars were placed in pairs, teeth uppermost, on chairs bolted to the sleepers. The teeth of the rack-bars were arranged so that they were “out of step” - the teeth of one rack being adjacent to the indents on the other. A pair of stepped pinions on the locomotive engaged with the double rack, and so smoothness of action was ensured. THE SNOWDON MOUNTAIN RAILWAY in Wales employs the “Abt” system illustrated here. This type of rack rail, patented in 1882, has teeth cut in the edges of narrow rectangular bars which are fitted in pairs to the sleepers so that the teeth of one rack are opposite the indents of the other. The first line to use the Abt system was built in 1884 at Blankenberg, in the Harz Mountains. In 1894-96 a rack railway on this principle was built on Mount Snowdon in Wales. The Snowdon Mountain Railway is four and three-quarter miles long with a rise of 3,140 ft. The maximum gradient is 1 in 5½, and the gauge is 2 ft 7½ in. A type of Swiss-built locomotive for use on an Abt rack railway is carried on six wheels. The four leading wheels run loose on their axles and the trailing wheels are mounted on a Bissell truck. There are two cylinders, placed midway along the engine above the foot-plating. The drive is of rather unusual design. The piston rods are made very long to reach the cross-heads at the front of the engine. The crossheads actuate cranks on the central axle through connecting rods and rocking levers pivoted low down on the frame. The two leading axles are coupled by rods, and on each is a double pinion, gearing with the rack. It is, of course, the axle pinions that transmit the power - the wheels are for carrying purposes only. The double pinions are interesting, since they are permitted a slight up and down movement, independently of the axles. This is attained by using a pair of toothed rings, placed one on either side of a circular disk forged solid with the axle. The movement of the pinions is permitted by the use of internal springs. To ensure smooth running the teeth of one pinion are adjacent to the spaces on the other - the usual practice with the Abt system. The pinions are held in place laterally by grooved brake drums, bolted on either side to the axle disks. The engine resembles the Riggenbach locomotive, since it pushes its train up the mountain side. There are no couplings, and three forms of brake are available. These comprise brake blocks that grip the drums on the driving axles, an automatic steam brake acting on two of the drums when the speed exceeds five miles an hour, and the use of compressed air in the cylinders as on the Riggenbach engine. The last-named method is generally used and, since the compression generates heat, the air in the cylinders is cooled by means of water jets. The boiler of the engine is inclined at an angle of 1 in 11 to obtain a comparatively level surface to the water on steep gradients. The pressure is 200 lb per sq in. The side water tanks carry 440 gallons, and the coal bunker 10 cwt of fuel. The engine, which weighs in working order 17 tons 4¼ cwt, can propel a load of 18.5 tons at four to five miles an hour. Another rack system was used on the railway up Mount Pilatus, near Lucerne, Switzerland. The Pilatus line, constructed in 1886-88, was so steep that a double rack - devised by Dr. E. Locher - was employed. The rack is double, as in the Abt system, but is placed horizontally with the teeth on both sides instead of on top. The Pilatus Railway is two and three-quarter miles long and rises 5,347 ft, with a maximum gradient of approximately 1 in 2. To carry passengers up an incline of this nature every possible precaution had to be taken to ensure safety, and the Pilatus steam car incorporates a number of highly ingenious devices. THE LOCHER RACK is employed to take the railway up inclines of 1 in 2 on Mount Pilatus in Switzerland. The car is prevented from leaving the track by a central guide which carries the double-sided rack. 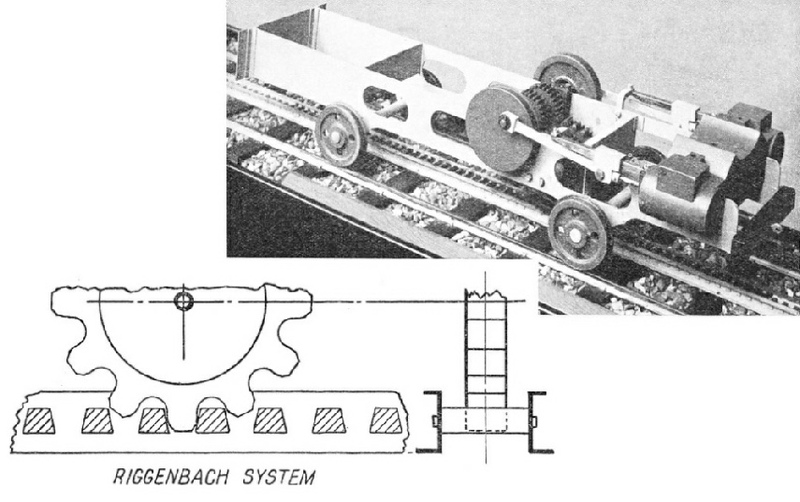 Horizontal driving wheels engage on either side of the rack rail. The under frame of the car is carried on four wheels. These are not power-driven and are for carrying only. Contrary to expectations, the wheels are flangeless, a feature necessitated by the remarkably sharp curves of the route. The car is prevented from leaving the track by means of the central guide that carries the double-sided rack. The under frame carries at the lower end a pair of horizontal driving wheels on vertical shafts, one on either side of the central rail and rack. Each driving wheel comprises a lower ring that rolls on the side of the central rail and an upper toothed portion gearing with the rack. The rings are of sufficiently large diameter to prevent the wheels from rising out of gear. Another pair of similar wheels at the front end of the frame is used to guide the car and to work the automatic brake. The pinion wheels at the lower end of the car are driven by two horizontal cylinders through a crankshaft and gearing. The boiler is of the locomotive type, placed across the frame, and works at a pressure of 176 lb per sq in. The brakes that control the descending car are a hand brake on one of the engine cranks, a cylinder air brake as on the Abt locomotives, and an automatic brake that acts on a drum. The drum is connected with the front pair of toothed wheels by worm gearing. This brake comes into operation automatically should the speed exceed three miles an hour, and can also be applied by the brakeman on the front of the car. As an additional safeguard the car is fitted with clips embracing the running rails, to guard against derailment by wind. The car weighs 10½ tons in working order, and carries 176 gallons of water and 2½ cwt of coal. The normal speed of the car is two and a quarter miles an hour. Another method enabling engines to climb mountainous railways is the “Fell” system, which is widely used for this purpose in many parts of the world. This method of increasing the adhesion of locomotives by means of a central rail was proposed by Mr. J. B. Fell during the construction of the Mont Cenis Tunnel. Patents for the special locomotives were granted to Mr. Fell in 1863-69, and a line was built over the Mont Cenis Pass. This railway was laid along the public road for a distance of forty-eight miles with a maximum gradient of 1 in 12, and was opened in 1868. The line was not, however, a financial success, and was closed down when the Mont Cenis Tunnel was opened in 1871. A model of a “Fell” engine built for the Mont Cenis line may be seen in the Science Museum, South Kensington. The engine was carried on four-coupled wheels, 2 ft 4 in diameter, driven by a pair of 16 in by 16 in horizontal cylinders. The cylinders were placed inside the frames with the valve chests between them. Valves were driven by outside eccentrics, link motion, and rocking shafts. The additional adhesion was obtained by means of a central rail laid on all gradients steeper than 1 in 25. 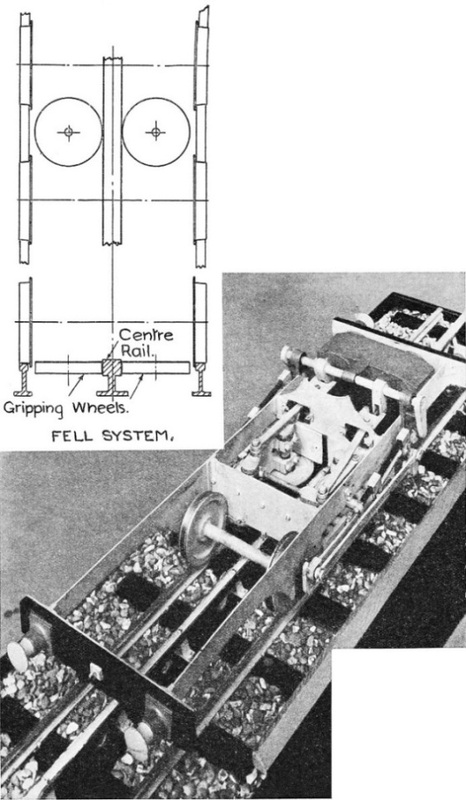 The central rail was gripped on either side by a pair of 2 ft 4 in wheels, pressed inwards by springs and levers, operated by screw gear from the footplate. Each pair of vertical shafts was held in a sliding frame between two transverse stays placed near the middle of the engine. At the upper ends of the shafts were overhung cranks, and the gripping wheels were fixed to the lower ends. The shafts on either side of the central rail were coupled by rods at the top and bottom, and were driven direct from the engine cylinders. 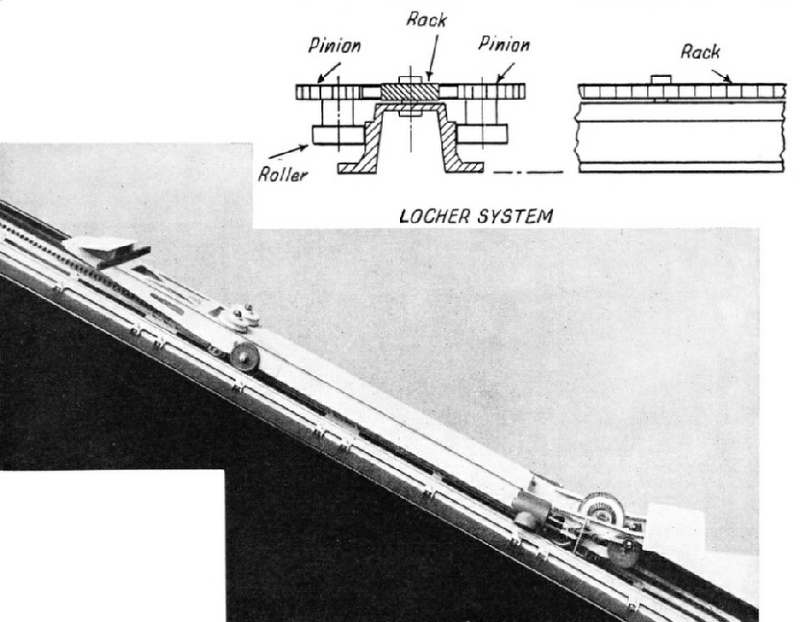 ADDITIONAL ADHESION for locomotives when climbing steep gradients is given on the Fell system by means of a centre rail gripped on either side by horizontally placed wheels. This system was first used on a line laid over the Mont Cenis Pass and opened in 1868. 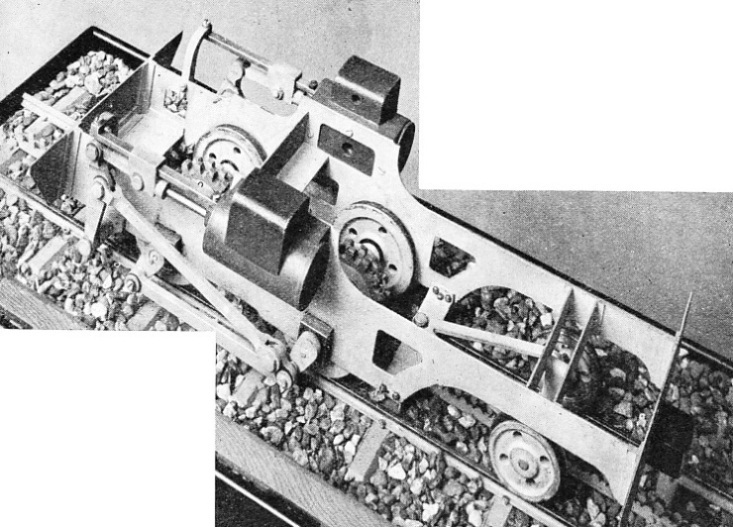 The motion of the crossheads was communicated to the carrying wheels through rocking shafts, levers, and outside connecting rods. The boiler pressure was 120 lb per sq in and the weight of the engine, in working order, about 20 tons. The pressure of the wheels against the centre rail was also some 20 tons, thus doubling the adhesion. The engine was capable of hauling a load of 20 tons up a gradient of 1 in 12 at a speed of ten miles an hour. The central rail was double-headed and was laid on its side, supported on chairs of bent wrought iron bars. Braking was effected by blocks acting on the carrying wheels and also by means of slipper blocks that gripped the central rail. The Fell system is used on the famous Rimutaka incline on the North Island of New Zealand, and the picture on page 260 gives a fine impression of five Fell engines climbing the gradient. A full description of the New Zealand fell engines is given on page 261. In another system, invented by the famous Swiss engineer Wetli, additional rails were laid between the track rails in the form of inverted V’s, with the apexes pointing up the incline. A double helix on a drum beneath the engine, driven by the cylinders, engaged with the V's and so propelled the locomotive forward. The helix may be regarded as a raised V round the drum. The Wetli system has not been used in practice chiefly because of the difficulty of laying the V’s sufficiently accurately to ensure smooth working. In addition, it was not suitable for use on small-radius curves. Rack engines have been improved in detail of design since they were first evolved, particularly when electric traction is employed, but the working principles of the various systems have remained unchanged. Rack railways, employing one or other of the foregoing systems, operate in all parts of the world. Many of the most spectacular rack railways are to be found in Switzerland, and are used mainly for tourist traffic. A number of these lines, in addition to the railway referred to earlier, are operated on the Riggenbach system. These include the Rorschach-Heiden Mountain Railway, the Schynige Platte, and the Wegernalp, the last two of which are electrically operated. In contrast with the Swiss rack railways is the Riggenbach rack section of 1 in 16 between Lengue and São Pedro on the Benguella Railway in Africa. The Abt system is also used extensively in Switzerland, notably on the Brienz-Rothom, Furka-Oberalp, and Glion-Rochers de Naye rack railways. Electrically operated Abt rack rails include those on the Gornergrat-Zermatt and Visp-Zermatt mountain railways. The rack rail is an ingenious device for overcoming the difficulties encountered by railway engineers in mountainous country, but high speeds are naturally out of the question. Even on the relatively speedy Visp-Zermatt line the rate on the steepest rack sections falls to ten miles an hour or less, but the grade of 1 in 8 could not be climbed by a locomotive relying on adhesion alone. THE WETLI SYSTEM. In this system additional V-shaped rails were laid between the track rails. The V’s, which had their apexes pointing up the slope, were engaged by a double helix on a drum revolving beneath the locomotive, and so propelling it forward. You can read more on “The Conquest of the Clouds”, “The First Mountain Railway” and “Wonderful Alpine Ascents” on this website.